These lovely, local venues offer everything from hostel-style, dormitory accommodation to self-catering chalets and luxury venues too. Our Forest Run routes cross onto the properties owned by some of these venues. Click to view a full-size map. Or download as a PDF. For a more rustic experience, these are two bushcamp venues. Oppikant has two A-frame, thatched huts with two single beds each. It has battery lights, a gas stove, geyser and fridge. Wood is provided. Ablutions include a hot water shower, flush toilet and hand basin. Bedding is provided; bring your own towels. Rate is R250 per hut. Boplaas consists of four huts with bunk beds and mattresses that sleep 26 people in total. It has a gas fridge and stove. There’s a kitchen, boma and braai facilities and ablutions. Bring your own sleeping bags and towels. Boplaas is R70pppn. This is a lovely large farmhouse with four double rooms that are tastefully decorated and serviced daily. The rate of R600pppn includes dinner, bed and breakfast as well as coffee/tea and rusks at 07h00 every morning. Technology here is from a bygone era – a hot-water donkey, gas geyser, candlelight (LED lights too) and stove kettles. Nevertheless, the facilities are of outstanding quality so as not to sacrifice luxury and comfort. You can just book a room (you don’t have to book the whole house). There is also a self-catering 4-sleeper unit (1 x double, 1 x twin rooms plus a sleeper-couch for children under 12). The property leads down to the Vaal River. Delicious meals are prepared by your host, Rassie, and are served in the traditional culture of the Afrikaans household. Definitely request Rassie’s potato wedges when he checks with you on a dinner and breakfast menu. I spent a night here recently and highly recommend this lovely venue and hospitable host. Bath towels are not included; please bring your own. Knopberg has three lovely self-catering chalets and they have a special rate for our weekend, just for Forest Runners. The smallest, Honey Bush Cottage sleeps 2 and is R750 per night. Lemon Blossom Farm House has three bedrooms and sleeps 6 people. It is R1380 per night. Shepherd’s Tree is the biggest with four bedrooms. It sleeps 8 people at R2250 per night. Located on a private game reserve. Higher clearance is nice, but not necessary. I have driven this route with no trouble in my Polo. There are two options here. The first is the self-catering Lodge, which has three rooms with three single beds each (shared showers and loos) and one larger family room with a double bed, two singles and an en suite bathroom. There’s a boma and a central kitchen – perfect for a big group of friends. The rate is R150 per person per night and R75 for children under 12 years. This pretty self-catering cottage is perfect for a group of girlfriends. Think Martha Stewart – only better. Lovely, pretty touches everywhere. There are three bedrooms: two with double beds and one with twin beds. If you’re happy to share a double with a friend, this pretty cottage is a wonderful six-sleeper (or a four-sleeper if you’re not). The rate is R180 per person per night and R80 for children under 12 years. You’ve got a range of self-catering options here – from lovely chalets to camping. They have four comfortable chalets – with lovely bush views – that sleep 2 people. The rate for a weekend is R1,750 (for two people, two nights). The Lodge sleeps 10 people and rate is R1,250 per day. There are two Hiker’s Huts, which sleep 8 people each. They have electricity and a basic kitchenette plus bunk beds. Bring your sleeping bag and towel. The rate is R60 per person (minimum rate of R360 per day for each Hut). Try something different and stay in a luxury caravan. It has a private shower and toilet plus under-roof parking for your car. It is fully equipped with bedding, fridge and stove. The rate is R300 per day for 2 people. If camping is more your thing, bring your own tent or caravan and enjoy this lovely location. It has 25 stands with 15 amp power points. There are clean ablutions and braai facilities. There is also a swimming pool, children’s playground and a volleyball court. There is an under-roof facility with two gas stoves, a washing up area and a laundry area. The rate is R200 per site for one or two people plus R100 for every additional person. Maximum 6 people per site. Children under 12 years free. Across the road from our host venue, Thaba Noka has a number of self-catering options. The venue is on the river and has a jetty, pool, jungle gym and a host of other facilities. The Fin & Feather Honeymoon Cottage is a 4-sleeper luxurious venue complete with two rooms with king-size beds, a jacuzzi, en-suite showers… With four people it is R750pppn (or R3000 per day for the Cottage). The Main House sleeps 8 and has 2 x double rooms and 1 x room with a double bed and two singles. This is a double storey house that near the river. Fill the house with 8 people and it works out to R400pppn (or R3200 per day for the House). Brian’s Cabin can sleep 5 and has a bedroom with a queen-size bed plus two single beds on the mezzanine level and a futon-couch for the 5th person. With five people it is R320pppn (or R1600 per day for the Cabin). You’ve got a wide range of options to choose from here. Thabela Thabeng has a bunch of self-catering chalets (2 to 10 beds), which you’ll run past on the longer routes. Rates vary from R990 per night for a 2-sleeper to R1150 per night for a 4-sleeper and R1600 per night for a 6-sleeper. There are a few in between options too on both Thabela Thabeng and Riversong properties. This lovely property has river access with a number of the units looking onto the river. There are a range of self-catering options from thatched roof chalets (6 available, 4-sleeper) to a large log hut (8-sleeper), guest rooms (2-sleeper) and river chalets (4-sleeper). 4-sleeper options are R700 to R800 per night (for the chalet). The 2-sleeper guest rooms are R500 per night for the room i.e. R250pp). The Venterskroon Campsite is fabulous with its ideal location and campsite. They have a student group booking for our weekend so only their camp sites are available. The campsite and ablutions are available. “Suikerbos” (above) is another venue with camping. Our start and finish venue is located in the historic of Venterskroon. They have three, pretty, double-bed rooms in what was the old Venterskroon Hotel. Their rate is R200 per person per night. Otters is just across the river from Parys – totally easy access to the town if you’re bringing supporters who may want to tour the lovely shops in town. You’ll probably see owner Karen Addison out on the route. Otters’ Haunt has a number of options from 2-4 sleeper cabins to the 8-sleeper ‘Otters Den’ farmhouse. Rates vary from R295 to R365 per person per night depending on the cabin. You’ll be very well taken care of at this in-town option. There are eight rooms, mostly for couple with double, queen or king-size beds. One room, Zebra, has a double bed and one single bed. Rates are R750 for a double room, R580 for a single room and, as an optional extra, breakfast is R100 per person. This is not a self-catering venue, but as you’re in Parys town, you have close access to dozens of fabulous restaurants for dinners. There are literally hundreds of options within 30 minutes of the event area. From camping to caravanning, B&Bs, guesthouses and lodges, you’ll find a wide variety in this area through accommodation-booking websites. We recommend that you check out our map (above) to compare the location of the start to venues that you find online. 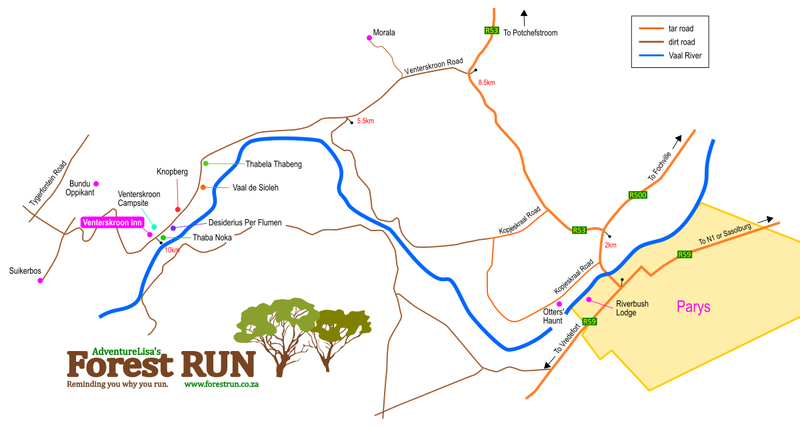 From Parys’ bridge over the Vaal River it takes 25-40 minutes from Parys to the start venue – depending on your type of vehicle. In a double cab, I do the 26km trip in 25 minutes from the Parys bridge. In my VW Polo, I do it in 35 minutes – travelling slower on the dirt road. See the ‘Venue‘ page for specific directions.